You Can Be in Crochetvolution! Recently, I had the opportunity to make a little something for a friend who is expecting a girl. All of my children are boys, and so I leaped at the opportunity to finally make something GIRLY! 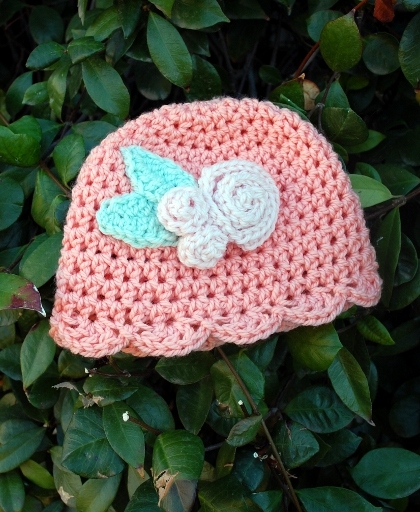 Some roses here, some shells there, the pinks and peaches I never get to use – this is literally the most feminine baby hat I could imagine, although that could easily be because years of toy cars and dinosaurs have stunted that part of my brain. This yarn has been discontinued. An appropriate substitute could include: Debbie Bliss Cashmerino Aran, Cascade 220 Wool, Patons Classic Wool, Lion Brand Vanna’s Choice, or any other smooth, plied, Aran/Heavy Worsted weight yarn. NOTE: Hat is meant to be worked in a continuous spiral; do not join rounds unless directed. Rnd 4: [Hdc inc in next st, hdc in next 2 sts] around. (32 hdc) SMALLEST SIZE ONLY, skip to straight section. Rnd 5: [Hdc inc in next st, hdc in next 3 sts] around. (40 hdc) MIDDLE SIZE ONLY, skip to straight section. Straight Section: Hdc in each st around for 6 (8, 11) rounds, then sc in next st, sl st in next st. Edge: Sc in next st, sl st in next st. *Ch 1, sk next st, dc in next st. [Ch 1, dc in same st] 2 times. Ch 1, sk next st, sl st in next st. Repeat from * around, making last sl st in sl st at beginning of round to close. Finish off. With pink yarn and H hook, ch 27. Sk 2 ch; dc inc in each ch across. (50 dc) Finish off. 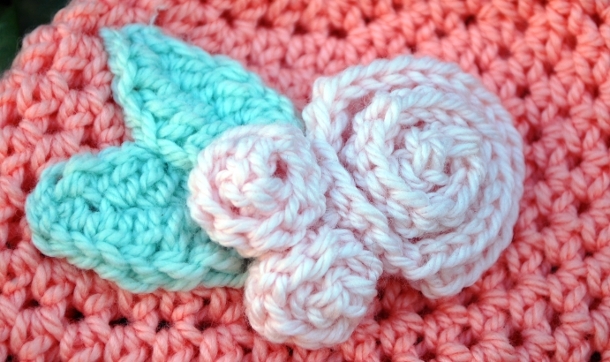 Curl up into rose, sew together along ch to prevent unrolling. With pink yarn and H hook, ch 8. Sk 2 ch; dc inc across. (12 dc) Finish off. Curl up into bud, sew together along ch to prevent unrolling. With green yarn and H hook, ch 7. Sk 1 st, sc in each of the next 2 sts, hdc in next st. Dc in each of the next 2 sts, make 3 hdc in last ch, ch 1. Working in other side of ch, make 3 hdc in first ch, dc in each of the next 2 ch. Hdc in next st, sc in each of the next 2 sts, sl st in last st. Finish off. Finishing: To finish, arrange leaves, rose, and buds on hat as desired and sew into place. Weave in all ends. Melissa Mall is an at-home mom with four sons seven and under. They are currently residing in Arizona after a three-year stint in Japan and are having a fun time readjusting. You can keep up with their ordinary adventures over at her blog, or take a peek at her crochet patterns and tutorials at Inner Child Crochet. Pattern & images © Melissa Mall. All rights reserved. This absolutely gorgeous. I’m going to make it right now! Thank you! I am a beginner crocheter, and I love your patterns, I cant wait to try this one, I am still getting use to reading them, so when I get it done I will send you a picture, thanks for your wisdom and creativety! Great pattern – may I have a copy? How do you suggest we join and start rounds.? I see no instructions for doing that. It is a very pretty hat. Just what I am looking for. Thanks for sharing your pattern. Jennifer — End rounds with a slip stitch into the first stitch of the round. Start the next round in the next stitch. Betty — “inc” means “increase”: do two stitches in one stitch. In the 3rd row, it says “HC inc in next stitch”. What is an “hc”? is it a half crochet/slip stitch or a typo for HDC? This is for a “chic” baby. Simply Beautiful. I like how this looks. but this pattern is not clear. There are steps missing. Love this pattern!!! Thank You so much for sharing!!! This is such a cute girly baby hat! i have been searching all over for this pattern and could not find it, at last!!!!! Thank you so much for sharing your pattern i am soooooo delighted now! Keep up your wonderful work! I am getting back into crocheting for my daughers’ soon to be newborn baby. I was able to find now to do the different stitches but am unsure what you mean by the SMALLEST SIZE ONLY AND MIDDLE SIZE ONLY. Hi, Midge! When it says smallest size and middle size, these are special directions based on which size you are making. So if you’re making the middle size, skip to the straight section after round 4. If you’re making the middle size, skip there after round 5. Hope this helps! I found this when I was looking for a way to make a hat that would look like the top of Candlehead (from Wreck it Ralph) for a Halloween costume for my 5 month old granddaughter. I ended up using this as the basis and with modifications it was my pattern. I used methods similar to the rose to create the lighter pink frosting on top. It turned out great! it is irresistable! It is 1:10 am I am going to start right now! Now if I can find the llittle dress you made I will make that too. First of all thanks for posting your patterns for others to enjoy…I am a brand new to crochet and don’t completely understand the pattern. ..should I chain 2 at the start of each round to join at the end of each round and would i also do slip stitch at the end of the round on this same chain. Again thanks for your creativity and kindness..
Love it. Thought the flowers were going too be hard,but they were really easy. Thank you for the adorable Baby Belle hat pattern! They are so cute, I’ve been making several for the USO. 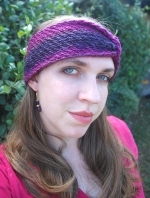 I’ll also be featuring your hat in an upcoming blog post. Thank you for developing such a sweet shareable pattern! Lovely pattern but I have a question. For the straight section, if I’m making the smallest size, after the 6 rounds, what do you mean by sc in next st then sl st in next stitch? Is this at the end of the 6th round or at the end of every round? The edge section starts with the same instructions. I presume this is done once the 6th round has been joined by a sl st? Any clarification you could provide would be most appreciated. The hat is meant to be worked in a spiral, not joining each round, so the (sc, sl st) is to create a smooth transition from the hdc to the previous round. to be notified when we have new content!